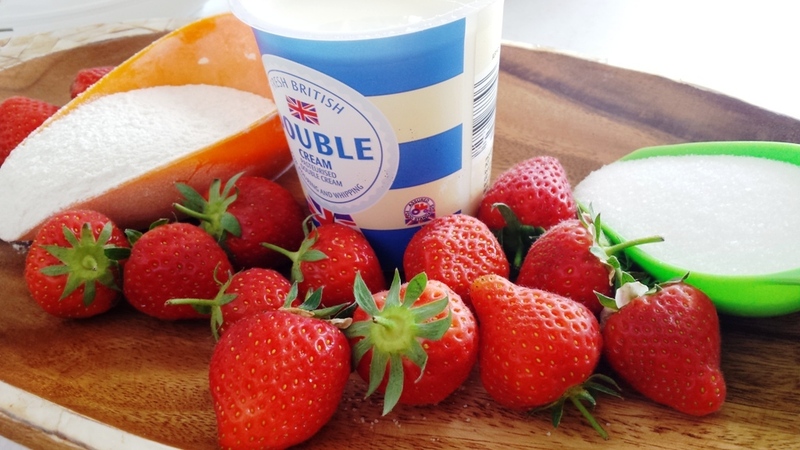 Strawberries & Cream are such a great combination – These two together is like a marriage of deliciousness on a plate. This cake makes an elegant presentation without too much fuss and perfect for a summertime party, a birthday. 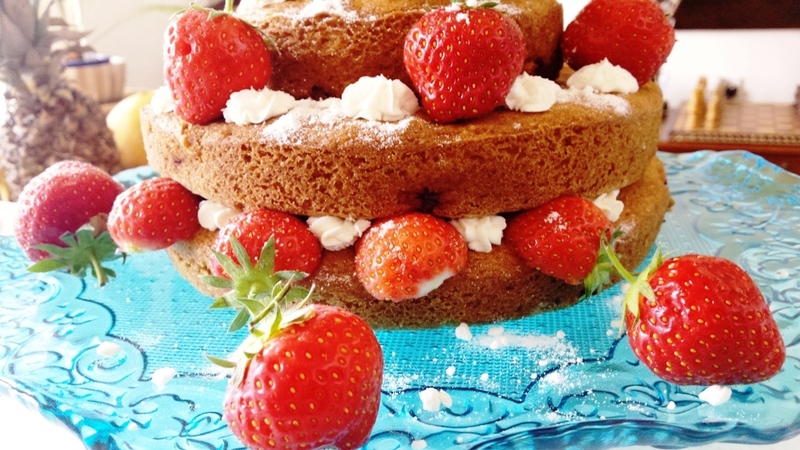 It is a great way to use berries in their prime and here I have used fresh strawberries. A moist cake infused with cardamom syrup. This cake looks as gorgeous as it tastes. Preheat the oven 180 C (350 F). 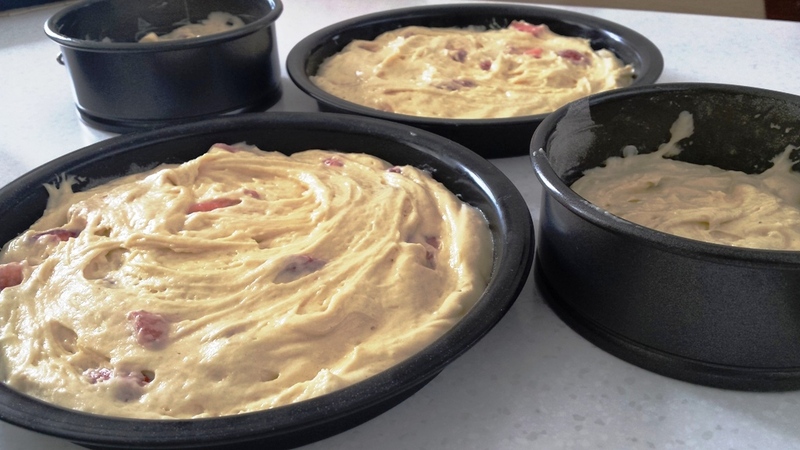 Line two 18cm sandwich tins and 12cms tins with baking parchment and brush with butter. Prepare the strawberries, hull half of the berries and slice them in quarters. Keep the other half whole and set aside. Beat the butter and the sugar till pale and fluffy. Add the eggs, one at a time, beating well. Fold in the flour, one spoon at a time. Fold in 2-3 Tbs of the fresh cream in the mixture. Do not overbeat the mixture. Gently fold in some of the strawberries (optional). Divide the mixture evenly between the tins and level with a knife. 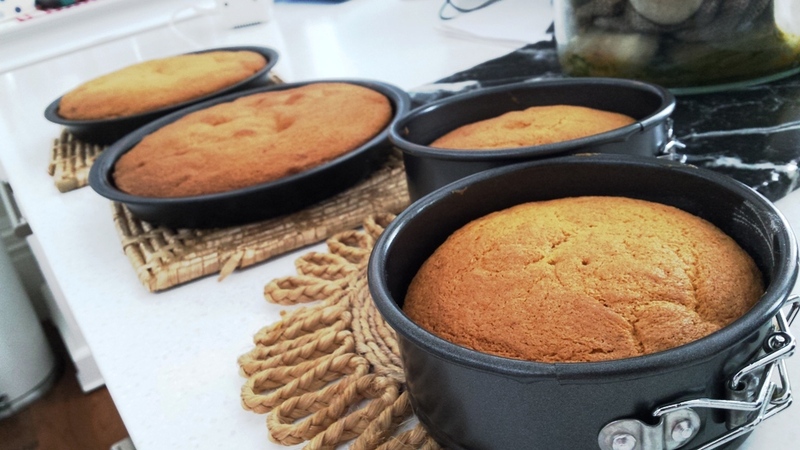 Bake in the oven for 20 minutes until the sponge cakes are well risen, golden brown and firm to the touch. Prepare the cinnamon syrup, in a small saucepan mix granulated sugar, water and ground cardamom. Place on a low heat and simmer until a runny syrup is obtained. 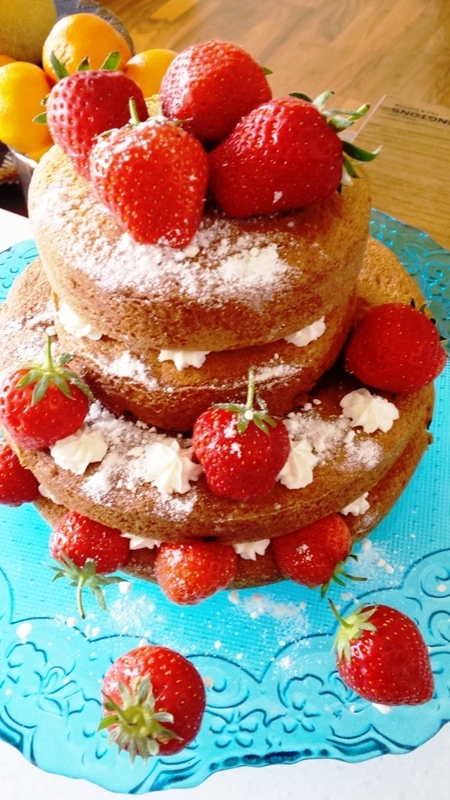 Cool the sponge cakes on a wire rack. Whip the cream till quite stiff, mix in the icing sugar and the vanilla. When the cakes are cool, spoon the syrup on the cakes. Start to assemble the cake by piping the whipped cream on top. 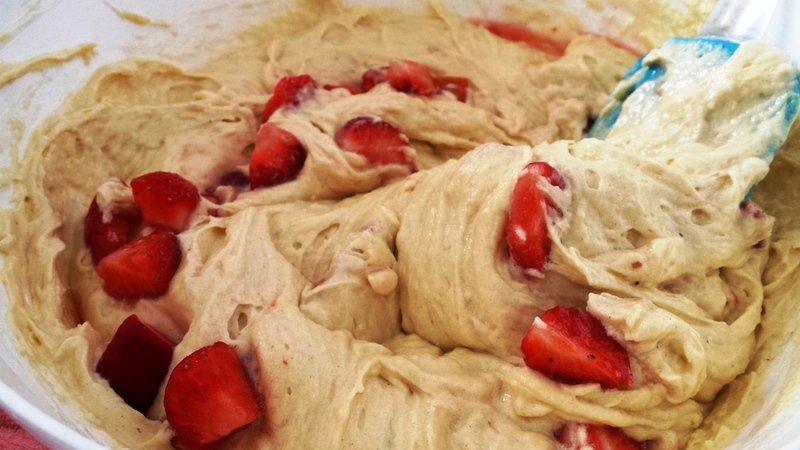 Place some of the strawberries on top of the cream. 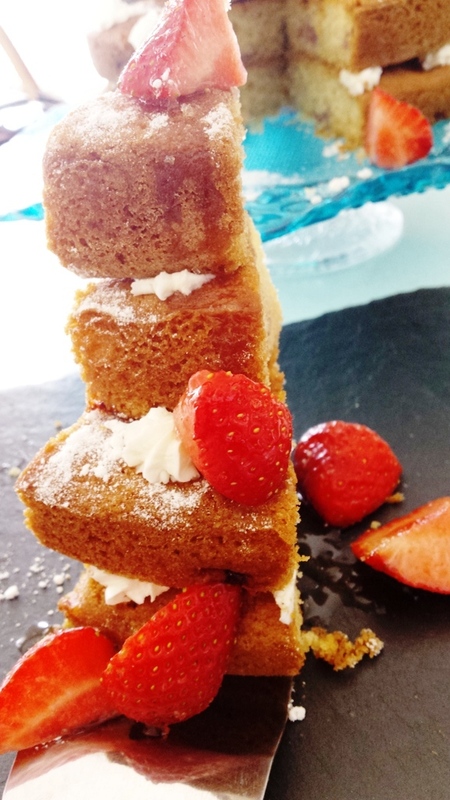 Place the other sponge cake on top and spread with the remaining whipped cream (feel free to decorate the cake as you wish). Sprinkle with the meringue dust or icing sugar on top. 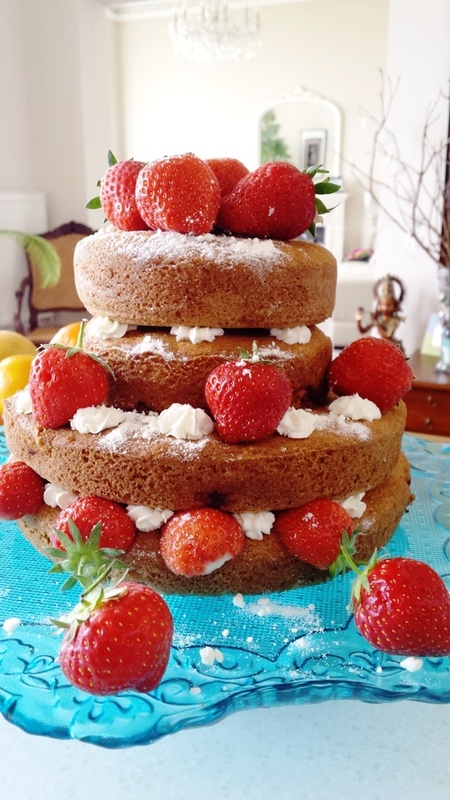 Brinda’s Note: This cake can be made with other berries such as raspberries or blackberries instead, or even a mixture of all three.